You may have some old VHS tapes that you want to digitize to play on your computer or media player, or don’t feel like spending money on an HD recorder for your satellite or cable TV box, but still would like to record your favorite programs. It’s actually possible to do so for less than $7 thanks to USB video grabbers. Those USB capture cards are nothing new, but I did not know the price had come down that much. One of the cheapest capture card is Easycap DC60 (clone?) that sells for $6.80 on Aliexpress, and runs on Windows, and (if you are lucky) in Linux. 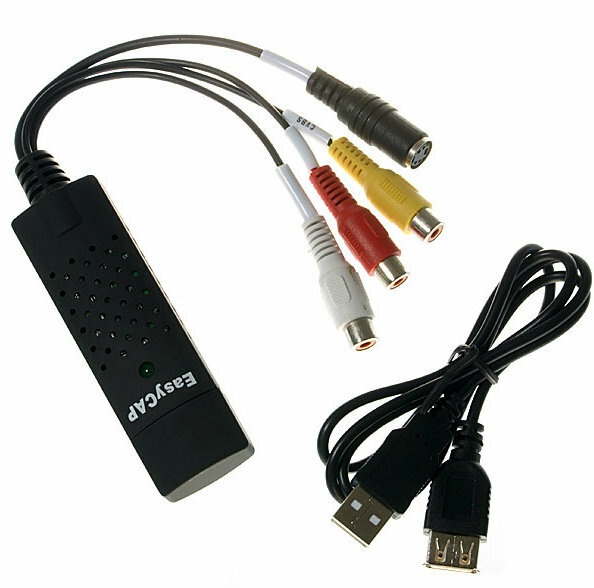 The device provides stereo audio input, composite input and S-Video input. It is sold with a USB cable to connect it to your computer. CD is normally provided with Windows drivers and program. All you need is a Windows 2000/XP computer with a free USB2.0 port, 256 MB RAM or more, 600MB available storage, and at least 1024×768 screen resolution. The program (Ulead Video Studio 8.0 SE DVD) needs Microsoft DirectX 9.0 and Microsoft Media Player 7.1 or greater to work. Feedback is good on Aliexpress, but not so much on Amazon, as it’s not exactly straightforward to install and configure. Those who succeeded appear to be satisfied. Somagic SMI-2021CBE – Should work in Linux, but does not work with ARM Linux yet. Fushicai UTV007 – Does not work in Linux. The re-sellers won’t usually mention which solution their device is based on, so if you intend to use such a device with Linux, you’ll have to take your chance. The Easycap DC60 model sold on Dealextreme ($8.90) appears to be based on Somagic USB video bridge. Onebir, a regular reader and commenter on this blog, suggested me to try it with one the mini PCs and write instructions, as some people might be interested to record and watch Cable TV programs with their HDMI TV Dongles. In many countries, cable TV is now broadcasted in HD, but recording with such device would downscale the resolution to NTSC/PAL, so I’m not sure that many people would be interested. If you are, please leave a comment, and if enough people beg ask me to give it a try, I’ll buy one. I doubt it will work with Android, so it would be done in Linux which narrow down the sticks that can be used, especially since we’d also need proper video playback of. If somebody has already done something like that, just let us know. This device got horrible quality. I’ve used an old miniDV Sony camera to capture the analog vhs video and passthrough it to Adobe Premier as DV with no actual recording on miniDV tape. Transferred about 200 hours of vhs video, bob deinterleced it (to 50fps), audio filtering (Adobe Audition noise reduction) and copied the mono audio channel at 80% volume getting a “stereo” audio, one or two video noise reduction filters in virtualdub, and finished in 2pass x264 encoding with very high bitrate. The result quite nice compared to any other approach. FWIW: My cable company only provides digital signals (no analog TV), so this device won’t be useful for such a connection. Does that mean you only have have HDMI output on your cable TV box? Yes, I agree with you. However, the interesting thing is that my cable company does not provide analog TV at all. It provides only digital TV, of which 50+ channels are FTA (Free to Air), of which 20+ are HD. All included in the base price. Areal: DVB-T (Digitenne) Conax encrypted exept for National public TV. Cable provider DVB-C (Caiway) 30 most viewed channels non encrypted and extra channels, via additional subscriptions of course, Irdeto2 encrypted. As an exception they also provide a DVB-T signal for 24 Channels as well embedded on the cable. But no analog Channels any more. Sattelite: DVB-C (CanalDigitaal), Irdeto2 encrypted. A lot of TV’s these days are sold with Analog+DVB-T/C tuners and CI+ interfaces for decryption cards with Smartcard slots. The first LCD tv’s were sold with only DVB-T hence caiway’s decision to put a few DVB-T channels on the cable as well. No immediate tuner box needed. I believe ATSC is widely the US these days. But most decoders today provide analog and digital video out. But using direct digital tuners is a far more effective solution. 2. No video stream decompressing and compressing needed, quality loss again. 3. Digital TV-Channels are usually MUXed on a single frequency. So simultaneous recording of multiple channels with only one tuner. Only if the desired channels are in the same MUX of course. The one perk is the decryption. But there are (linux-friendly) tuners with CI slots. And there is always the possibility of using Generic smartcard reader and softcam decoders. But that’s of questionable legality. But for old VHS tapes/Videogame consoles/Survailence CAM’s/etc. this great. I’ll be looking for one of those as well. Thanks for reference for working models with linux. I’d put the VHS project on hold just because of that. And the price is right now too. Since the tuner is in the TV, how can you record programs? Does the cable company provide this service (e.g. store the program on its own server, and you can watch it later, provided the cable company also provides internet access), or would you have to purchase a separate recorder? I’m trying to do just this. Have you already made sure it works in a Linux PC? If it works, then the problem in your A10 board could be because of the USB drivers or some settings. Try the latest kernels 3.0 and 3.4, since there has been changes to the USB stack a few days ago. If you still have the same problem, post your issue in http://linux-sunxi.org/Mailing_list, or ask in #arm-netbook channel in irc. Recording: I haven’t done that yet (just switched from IP-TV on VDSL to cable-TV). My Sony TV has a USB port for recording, but I haven’t got that working. And I’m not sure if the cable STB has a harddisk built in. 4. Using a Linux/Windows box with a USB tuner and recording software, a home Brew PVR. Mythtv, Linux VDR, Media Portal, etc. Using the Decoder PVR or TV PVR has the downside that the recordings remain encrypted and cannot be archived / shared (with other devices). Using a separate decoder or the TV plus a capture device has the downsides of needing to sync the tuning and timing. You’ll need LIRC to automate it. Plus the TV becomes occupied during recording. And the loss of quality. But If you’re unlucky to live in a area where the broadcast signal is of proprietary encoding and/or decryption. The seperate tuner and capture device are indeed your only option. Next PostNext MK802 II Mini PC Now Costs as Much as Raspberry Pi Model B. Let’s Compare Them!